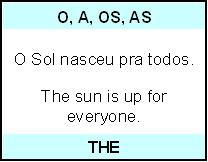 Welcome to Flashcards English Portuguese. Here you will find hundreds of options to learn Portuguese all day long. Since my early days as a language learner I’ve been using flashcards to learn new vocabulary in a quick, easy and enjoyable way. As a Portuguese language teacher, I use the same process to help my students learn a second language. Print them in a stiff paper, so that you can play with them for a long time. I used a set of plastic cards for almost 5 years. I hope you can do the same, learning Portuguese and making friends for your lifetime! Have you ever thought about which sentences people say at similar circumstances around the world? According to where, when or whom you are with, some phrases are likely to be said or heard, right? 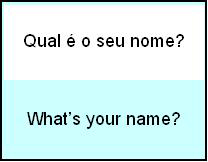 Download 100 Portuguese Phrases and say the right thing at the right time. It's just that simple. Verbs are the backbone of any language. By using them properly you can easily make your point to describe actions, conditions or experiences. Here you will find the main Portuguese verbs - plus 2 words that ‘go together’ with each of them. 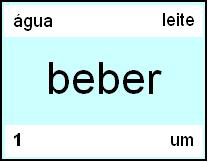 Print 100 Verbs and learn Portuguese anywhere. In any language, some words appear more often than other ones. As soon as you get used to these first hundred, you will be ready to manage the first 365. 100 Portuguese Words and celebrate. It's going to be a piece of cake.